The most skilled and passionate leaders are those that define and advance an industry. While healthcare continues to evolve, an IT leader’s work becomes increasingly urgent, and the need for talented, innovative individuals grows. 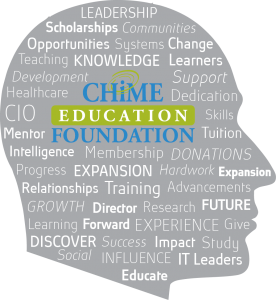 You can play a key role in fostering the next generation of healthcare IT leaders by helping to support the CHIME Education Foundation’s role in providing scholarships to educational and professional development programs to up and coming CIOs. With your generous support, the College of Healthcare Information Management Executives (CHIME) can maintain our obligation to advance the role of the CIO and address the increased need for a skilled and qualified IT workforce to support widespread adoption and use of health information technology. Your support makes a difference in the lives of future CIOs, as well as in the lives of countless healthcare patients for decades to come.